Careful management of extraction sockets after tooth extraction prevents unsightly bone loss and provides a better cosmetic outcome for tooth replacement. 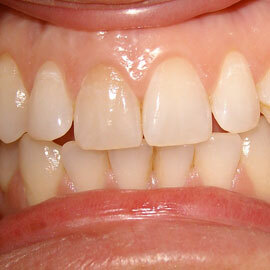 Ridge preservation is vital if the patient is interested in replacing missing teeth with dental implants. Ridge preservation is accomplished by bone grafting the socket. 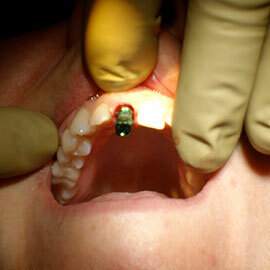 The following photos were taken during a recent implant procedure. 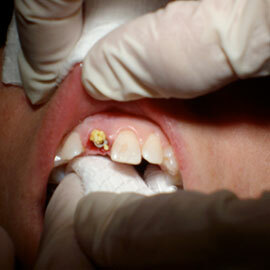 Dr. Roane carefully extracted a failed root canal tooth and immediately placed a dental implant into the socket. 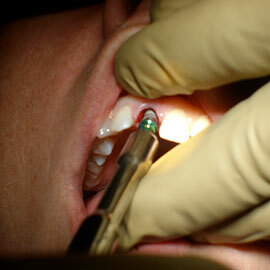 The tooth in question had been treated endodontically more than 20 years ago. 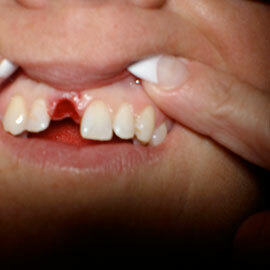 To try and keep the tooth, 3 apicoectomy procedures were done, but the tooth was beyond saving. Dr. Roane and his team extracted the tooth, placed the dental implant, grafted to preserve the ridge, and covered the graft with a resorbable collagen membrane. After the surgery was completed, he covered the surgical site with a periodontal dressing, which acts as a protective covering and keeps the area free of infection while healing. The patient has a removable partial to wear while the implant is integrating and until time to restore with a permanent crown. Due to the fact that this particular case is still integrating, we do not have the final picture to show. 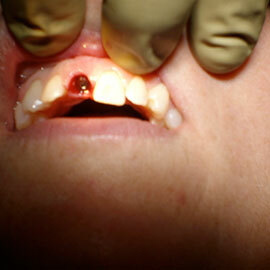 But as soon as this patient has the next procedure done, more pictures will be updated.